STEP 1 - Heat oven to 375ºF. Grease 8 regular-size muffin cups. Unroll 1 can of dough on work surface; firmly press perforations to seal. Press into 13x7-inch rectangle. 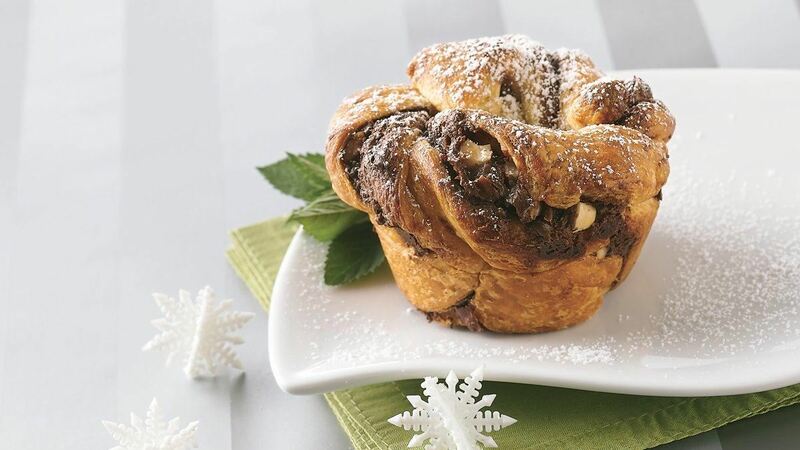 Spread hazelnut spread evenly over dough to within 1/4 inch of sides; sprinkle with hazelnuts. STEP 3 - Bake 20 minutes or until golden brown. Immediately remove from muffin cups to cooling rack. Cool 5 minutes. Sprinkle with icing sugar. Serve warm. Tip: Look for the hazelnut spread near the other baking ingredients.